Do you know someone who collects bathroom electronics? Just a funny name for all those hair dryers and curling irons that clutter the countertop in the bathroom. The problem is that when you are finished with them they are still HOT! For me, finishing my hair is the last thing I do before I walk out the door, so I leave my electronics to clutter the counter. Not really fair for my spouse who shares the bathroom. If you do the same, here is a great solution that will get those HOT electronics out of your way. Check out this silicone pocket. The Hot Iron Holster is heat resistant and holds curling irons, flat irons or hair dryers. It is made of 100% silicone and consists of two parts: A roomy pocket for holding styling tools and a flap that grips household surfaces. Combined, they provide a clever and simple solution for managing your hot styling tools and hair accessories. 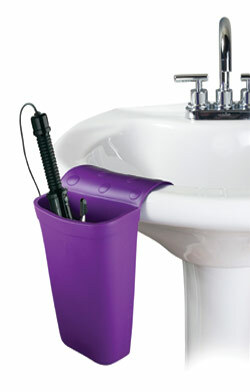 This entry was posted in Residential Organizing and tagged Bathroom Organizing, Electronics, Organizing Products. Bookmark the permalink.